SMITHFIELD– Bistro on Third and 231 Market Classic Printing have won the window display competition in Downtown Smithfield. With 105 of the 291 votes cast, Bistro on Third won the popular vote, while 231 Market Classic Printing won the very difficult juried vote. Rounding out the top five popular vote getters were Orchard House Booksellers, DNA Bail Bonds, Big Mike’s Bail Bonds and Tucker Furniture. As the winners, Bistro on Third and 231 Market Classic Printing will each receive an eighth-page color ad in The Herald and radio spots on WTSB 1090 AM and WMPM 1270AM. 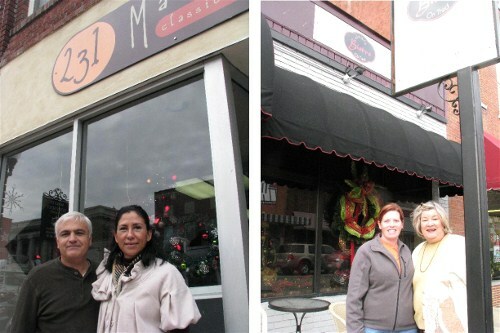 "We are so appreciative of this support from our wonderful customers," said Patti Stallings, owner of Bistro on Third. "We are so happy to be able to operate a business where our customers are like family here in Downtown Smithfield." Voters were entered into a drawing for $100 Downtown Smithfield bucks, to be used at any downtown business. Colin Campbell, of Knightdale, is the winning voter.